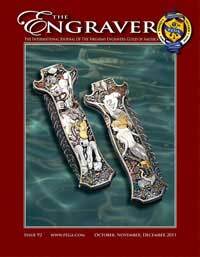 It is a full glossy, 32 page, quarterly publication that brings you in depth articles about hand engraving. These articles range from biographies of FEGA members to full instructional articles about various aspects of our fabulous art. Many of the articles are generic in nature and their instructional application can be used on guns, knives, jewellery and any canvas that is engravable. The magazine has many American as well as international contributors so there is a good mix of the latest information and trends from all over the globe. Members of all levels are encouraged to share their knowledge and stories with fellow members. In each issue their is a section for members to display photos of their work. It provides a chance for members to get their work published in a world class magazine. It is the only publication in the world that deals exclusively with the art of hand engraving. 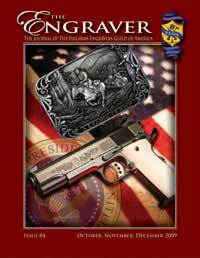 Written by hand engravers..........for hand engravers and those that love the art. You can download 2 free samples of the magazine by clicking the images on the right.